Since the launch of Azure Media Services our streaming services have been one of the biggest things that has attracted customers to our platform. It offers the scale and robustness to handle the largest events on the web including FIFA World Cup matches, streaming coverage of Olympic events, and Super Bowls. It also offers features that greatly reduce workflow complexity and cost through dynamic packaging into HLS, MPEG-DASH, and Smooth Streaming as well as dynamic encryption for Microsoft PlayReady, Google Widevine, Apple Fairplay, and AES128. However, our origin services (aka Streaming Endpoints) have always been plagued with the usability issue of needing to provision them with Streaming Units (each one provides 200Mbps of egress capacity) based on scale needs. We continually receive questions from customers and partners asking “how many Streaming Units do I need?”, “how do I know when I need more”, “can I get dynamic packaging without Streaming Units”, etc. Thus, we’re very excited to announce that we have a new Streaming Endpoint option called a Standard Streaming Endpoint which eliminates this complexity by giving you the scale and robustness you need without needing to worry about Streaming Units. Behind the scenes we monitor the bandwidth requirements on your Streaming Endpoint and scale out as needed. This means a Standard Streaming Endpoint can be used to deliver your streams to a large range of audience sizes, from very small audiences to thousands of concurrent viewers using the integration of Azure CDN services (more on that further below). More good news! We also heard your request to have a free trial period to get familiar with Azure Media Services streaming capabilities. When a new Media Services account gets created, a default Standard Streaming Endpoint also automatically gets provisioned under the account. This endpoint includes a 15-day free trial period and trial period starts when the Endpoint gets started for the first time. In addition to Standard Streaming Endpoints, we are also pleased to announce enhanced Azure CDN integration. 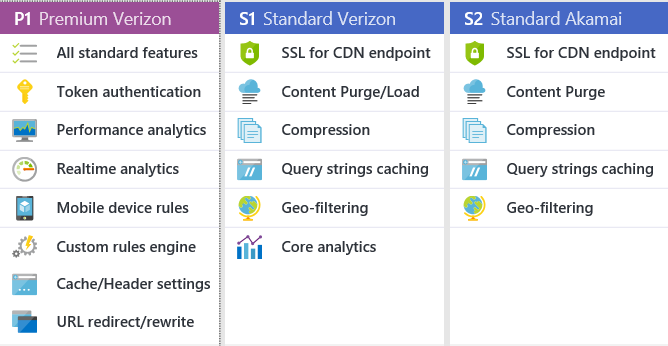 With a single click you can integrate all the available Azure CDN providers (Akamai and Verizon) to your Streaming Endpoint including their Standard and Premium products and you can manage and configure all the related features through the Azure CDN portal. When Azure CDN is enabled for a Streaming Endpoint using Azure Media Services, data transfer charges between the Streaming Endpoint and CDN do not apply. Data transferred is instead charged at the CDN edge using CDN pricing. Our previous Streaming Endpoints are not going away, meaning there are now multiple options so let’s discuss their attributes. But before I do let me first jump to the punch line and give you our recommendation for which Streaming Endpoint type you should use. We have analyzed current customer usage and have determined that the streaming needs of 98% of our customers can be met with Standard Streaming Endpoint and CDN integration. The remaining 2% are customers like Xbox Movies and Rakuten Showtime that have extremely large catalogs, massive audiences, and origin load profiles that are very unique. Thus, unless you feel your service will be in that stratosphere our recommendation is that you migrate to a Standard Streaming Endpoint. If you have any concerns that you may fall into that 2% please contact us and we can provide additional guidance. A good guide post is to contact us if you expect a concurrent audience size larger than 50,000 viewers. With that out of the way, here’s some finer grained details on the types and how they can be provisioned. Our existing Streaming Units have now been renamed to "Premium Streaming Units" and any streaming endpoint that have a Premium Streaming Unit will be named a “Premium Streaming Endpoint”. These Streaming Endpoints behave exactly as they did before and require you to provision them with Streaming Units based on your anticipated load. As mentioned above almost everyone should be using a Standard Streaming Endpoint and you should contact us if you think you need a Premium Streaming Endpoint. Any newly created Azure Media Services account will by default have a Standard Streaming Endpoint with Azure CDN (S1 Verizon Standard) integrated created and placed in a stopped state. It is put into a stopped state so that it doesn’t incur any charges until you are ready to begin streaming. New Streaming Endpoints can also be created as Standard Streaming Endpoints. Previously, when a new Azure Media Services account was created a Streaming Endpoint was created with no Streaming Units(aka Classic Streaming Endpoint) . This was a free service intended to give developers time to develop services before incurring any costs. However, Streaming Units were needed to turn on many of our critical services such as dynamic packaging and encryption so the value was very limited. Some customers may still have one of these “Classic” Streaming Endpoints in their account. We recommend customers migrate these to Standard as well, they will not be migrated automatically. The migration can be done using Azure management portal or Azure Media Services APIs. For more information, please check "Streaming endpoints overview". As mentioned above we are offering a 15-day free trial on Standard which provides developers with the same ability to develop services without incurring streaming costs. Streaming Scale Up to 600 Mbps when Azure CDN is not used; With Azure CDN turned on Standard will scale to thousands of concurrent viewers 200 Mbps per streaming unit (SU) and scales with CDN. SLA 99.9 99.9 (200 Mbps per SU). CDN Azure CDN, third party CDN, or no CDN. Azure CDN, third party CDN, or no CDN. *Note: Free trial doesn’t apply to existing accounts and end date doesn’t change with state transitions such as stop/start. Free trial starts the first time you start the streaming endpoint and ends after 15 calendar days. The free trial only applies to the default streaming endpoint and doesn't apply to additional streaming endpoints. When to Use Azure CDN? As mentioned above all new Media Services accounts by default have a Standard Streaming Endpoint with Azure CDN (S1 Verizon Standard) integrated. In most cases you should keep CDN enabled. However, if you are anticipating max concurrency lower than 500 viewers then it is recommended to disable CDN since CDN scales best with concurrency. When operation is completed your classic endpoint will be migrated to "Standard"
Note: Stopping the endpoint will delete existing CDN configuration and stop streaming. Any manually configured setting using CDN management portal will also be deleted and needs to be reconfigured after enabling new CDN integration. Please also note that legacy CDN integrated streaming endpoints doesn't have the "Manage CDN" action button in the menu. Note: Starting the streaming endpoint and full CDN provisioning might take up to 2 hours. During this period, you might use your streaming endpoint however, it will operate in degraded mode. Manage CDN; after streaming endpoint is started and CDN is fully provisioned you can access CDN management. This will open CDN management section and you can manage and configure your streaming integrated CDN endpoint as a regular CDN endpoint. Note: Data charges from streaming endpoint to CDN only gets disabled if the CDN is enabled over streaming endpoint APIs or using Azure management portal's streaming endpoint section. Manual integration or directly creating an CDN endpoint using CDN APIs or portal section will not disable the data charges. Finally; with the release of standard streaming endpoints you will also get access to all CDN providers and can enable your desired CDN provider such as Verizon Standard, Verizon Premium and Akamai Standard with the simple enable CDN check box on the streaming endpoints. You can get more information on Streaming Endpoint from "Streaming endpoints overview" and "StreamingEndpoint REST"
We hope you will enjoy our new standard streaming endpoint and the other features. 1) How to monitor streaming endpoints? For the last couple of months, we were running a private preview program for our “telemetry APIs”. I know some of you already used the private APIs, but from general usage there was no public data and our streaming endpoints was a black box. Good news is, we just released our “Telemetry APIs”. With this APIs, you can monitor your streaming endpoint as well as your live channels. For streaming endpoint, you can get the throughput, latency, request count and errors count almost in real-time and act based on the values. Please check this blog post “Telemetry Platform Features in Azure Media Services” for details. You can also get more information from the API documentation. 2) How to determine the count of streaming units? Unfortunately, there is no simple answer for this question. The answers depend on various factors such as your catalog size, CDN cache hit ratio, CDN node count, simultaneous connections, aggregated bitrate, protocol counts, DRM count etc. Based on these values, you need to make the math and calculate the required streaming unit count. Good news is, standard streaming endpoint and Azure CDN integration combination will be sufficient enough for most of the work loads. If you have an advanced workload or you are not sure if standard endpoint is suitable for you or you want to get more insights on the throughput, you can use the Telemetry APIs and monitor your streaming endpoints. If your load is more than the standard endpoint targeted values or you want to use the premium streaming units, you need to make the math based on telemetry values and define the streaming unit count and scale accordingly. You can start with a high number, but after that you can monitor the system and fine tune it and based on the throughput, request/sec and latency numbers. 3) I don’t see CDN analytics for my existing streaming endpoints in the new portal. CDN management portal for existing CDN integrated streaming endpoints are not available in the new management portal and depriciated. To access the CDN management, you should migrate your streaming endpoint to new CDN integration. Please see migration steps above. Azure Media Services will continue to grow and evolve, adding more features, and enabling more scenarios. To help serve you better, we are always open to feedback, new ideas and appreciate any bug reports so that we can continue to provide an amazing service with the latest technologies. To request new features, provide ideas or feedback, please submit to User Voice for Azure Media Services. If you have and specific issues, questions or find any bugs, please post your question to our forum.